The small crew at Stagecraft Software has just finished and released their latest project, Scratch Track, which is a VST plugin that allows timecoded vinyl to be used in any DAW or audio software that supports plugins. Watch a complete demonstration of all of the plugin’s features that take timecode to the next level, read our quick interview with the developer, and enter to win one of three copies of the VST, all inside today’s article. We spoke to Aaron – the founder and sole employee of Stagecraft Software – to learn more about the plugin. Hey Aaron! What are the biggest advantages of using Scratch Track in a DAW versus a normal DVS system? Being a modular plugin certainly has its advantages. We can route the audio in creative ways, adding chains of effects to the turntables output, automating the parameters in ways that would not be possible in the real world (64th note crossfades, etc), syncing of the clips to the DAW playhead (beat matching loops, which means we can scratch them, but then resync at will), and recording snippets of sounds from the DAW to the plugin for immediate scratching (the plugin can record loops from the DAW). But the real advantage here is that we can record the outputs directly. From an EDM producer’s standpoint – this gets rid of the need for a massive amount of equipment, and a library of printed vinyls to scratch, plus reduces latency because we don’t need to use rewire or other third party drivers to route the audio from the DVS to the DAW. With one turntable, some time coded vinyl, and this plugin, you can lay down a collection of scratches immediately. 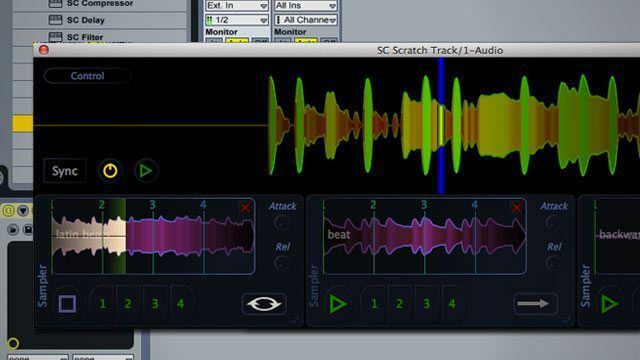 Put simply, this is the easiest way to add scratches to a track. What timecode vinyl does Scratch Tracks support? Serato Scratch Live, Traktor Scratch, Traktor MKII, Torq, Ms Pinky. Can you use scratch track to beatmatch/mix tracks in a more traditional manner well? Full tracks can be loaded up, and there is support for beat matching. Having said that – this product is not focused on traditional DJing (there are no playlists, and you cannot hold longer tracks in loop mode as you might with traditional DVS systems). It will allow you to crossfade between the DAW output and what is playing on the turntable, however, so for the DJ who wants to alternate between playing a track, and performing within a DAW environment, this is just the ticket. How is the latency? Will vinyl purists be happy with the response? On par with any DVS system – the turntable velocity curve is recalculated every 32 samples, regardless of input buffer size. The crossfade uses nonlinear equations to smooth the response between incoming midi notes, giving an extremely natural response curve. It is definitely up to professional standards. How big is your team, and how long did this project take? Ha! My team is me. I use “we” in all the videos because my marketing team (also me) thinks that sounds better. I have ongoing work with several well known music companies however, and am developing a VST effects library in conjunction with OpenLabs. Look for all that coming soon. Well, a few things are in the works. Several more plugins are already available on the website (Cloud Browser – which allows you to search SoundsCloud and then drag-n-drop samples right into your DAW, as well as a really nice delay plugin). And the ongoing standalone project (Livetronica Studio), which is a fresh approach to modular DJing. This is a standalone, live performance oriented, drum machine, plus plugin host plus synth, plus sequencer, plus DVS. Basically a DAW environment that allows scratching. Don’t expect this too be perfect just yet, but the beta is up and easily available on the website. Thanks to Aaron for spending a few minutes answering our questions – check out Stagecraft Software’s site for more about his ongoing projects.